As we just discussed yesterday, the season is over. What we did not discuss, yesterday, though, is that Worlds is roughly 6 weeks from the present moment. We’ll have lots of deck coverage and whatnot on SixPrizes over those weeks, but for today, I’d like to take a look at the World Championships field we’re going to see in 2017 and the journey players took to get there. 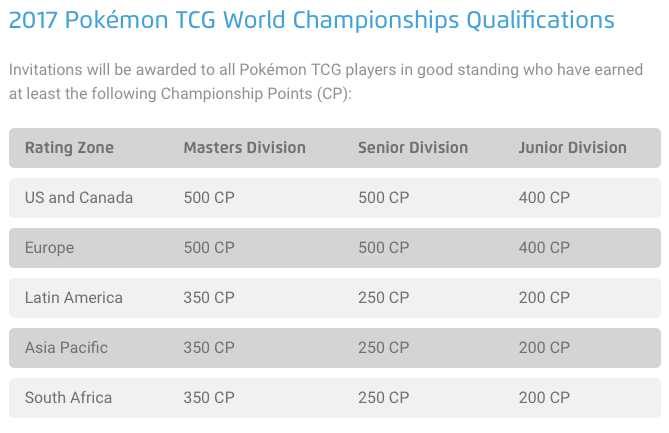 My hope is that this article, assuming TPCi doesn’t blow up the Worlds invite system again, can serve as a barometer for newer players in trying to understand the level of commitment required to achieve different levels of success in the game. But, for those who have been around awhile, my hope is that it’ll have interesting information for your consideration as well. Many players balked at the 500 CP requirement for North American and European Masters (and Seniors), while some others looked at the accompanying CP table and were horrified at the Regionals BFL of 8. Clearly, the expectation this season was that traveling was going to be a staple part of attaining an invite for many players, and for those seeking a Day 2 Worlds berth, it was going to be an absolute necessity. April comes along, and it seems as though things are going to get dire numbers-wise. 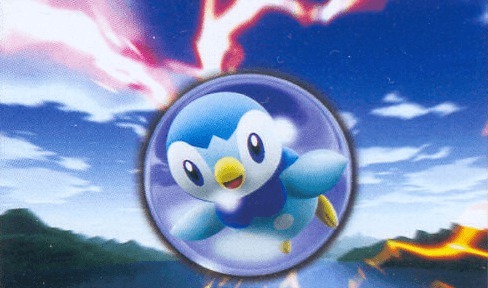 TPCi, clearly realizing their targets were about to be missed by a parsec or two, came along with some changes. We saw an updated CP Table take hold, along with an updated Qualification Table. Suddenly, the Worlds invitation that had seemed unattainable to many was well within reach. This breathed second life into a season that had been dying for many. It should be noted that the Day 1 numbers do not include Day 2 invitees. As you can see, while Masters numbers did end up in a place not too far out of line (especially if we ignore last year’s giant event), Junior and Senior invites are in what could definitely be called a sorry state. I’m not in a position to make a good guess as to the number of Rounds those division face on Day 1 this year, but I’m certain it isn’t a high one. In addition, we are apparently awaiting uploads on 2 Latin American Regionals and 1 Latin American Special Event, so those numbers could still grow a bit. An aside: this year, Japan’s invitation structure mirrors our own a bit more. In each of their 3 age divisions (April 1, 1999-back; April 2, 1999-April 1, 2006; April 2, 2006-present), the Top 8 players in Championship Point rankings receive a Day 2 invitation, while any player earning 5 CP earns a Day 1 invitation. In addition, the Top 4 players at the Japanese equivalent of a National Championship earned a Day 2 invitation regardless of CP standing. However, there is also the problem of ties in CP Standing, so there will end up being at least 13 Masters (potentially +4 for Nationals T4, unless there is overlap) with the Day 2 invitations. Thanks to Franco Takahashi for the details on the structure’s workings, and if you want to take a glance through the aforementioned Standings for their CP, you can check them out here (I’d recommend using Google Chrome or another translation-equipped option). The Top 16: These are the players who had superb seasons and landed in the position to bypass Day 1 of the World Championships. For any player, this is the ultimate in places to be. The “Close, but Try Again Next Year” Club: These are players that came close to that Top 16 berth, but didn’t quite get there. For the purposes of this article, I’ve cut the dividing line between this category and the next at 900 points, or 30th place — players that were within a good run or two of Top 16. The Day 1 Invitees: This is admittedly a somewhat-larger pool than the rest, but it’s composed of everyone from the “I barely got 500 points” club to those in the upper 800s. A large group, but one whose uniting factor was that they entered North America’s International Championship needing a very, very good run to make Top 16 (or, entered it needing the CP to get to 500 altogether!). With that established, let’s dig into our first group: the Top 16. Only reached by those at the top of their games. Overall, our Top 16 Players are notable in their proficiency on the Global stage. In a way, the World Championships’ share of that is a tad misleading — Sam Hough and Ross Cawthon are beneficiaries of 500 CP boosts from Top 4s in previous years, but other than that, they didn’t have much effect. What clearly set Top 16 apart was their attendance — and performance — at International Championships. As can be seen at right, only 1 player in Top 16 — Chris Siakala — attended only the North American International Championship. Everyone else was seen playing in at least one other International, and the majority of the group played in 3 or 4. As we’ll see in a minute, while our T16 still earned most of its points at Regionals, they earned a larger share at Internationals than any other group (this is, of course, self-fulfilling in a way: of course the players at the top performed at the highest-payout tournaments — that’s what put them at the top). Performing well at International Championships was the key to a Top 16 bid in this year’s invite structure. Particularly after the CP bump aided that segment of the structure even more, it became a reality that one needed to either perform extraordinarily well in Domestic events or have some IC points to back them up, if they hoped to reach the upper level of play. In fact, if we re-sort for points earned solely at Regional Championships in North America, only 8/16 of our Top 16 players remain in the “Top 16” of these new rankings. Instead, players who finished in the “close, but not quite” category, like Daniel Altavilla, Rahul Reddy, Caleb Gedemer, and yours truly, join T16’ers Igor Costa and Azul Griego at the top. Now, that’s obviously not something that ever would be done: Top 16 does demand competent play at all levels of the tournament structure. But, it can’t be understated how important performance at International Championships was this season for securing a berth. In addition, while not as important as we’ll see them be in our other two player categories, it definitely was nonetheless important to get those League Cup points in hand, as League Cups and Challenges made up just over 1/5 of the average T16’ers year — not shabby at all. Basically, the Bubble — in season-long form. This group attended more Regional Championships, but significantly less International events than our Top 16. To review, this group runs from 17th to 30th place in the final CP rankings, or, put differently, cuts off at 900 CP. These folks were one or two good Regional (or, International!) performances away from cracking the Top 16. Why do I divide this group into something of its rather than combining it with the rest of the Day 1 invitees? Simply because I believe there’s a difference between those that went for Day 2 invites (or, did well enough to be in the hunt, intentions or not) and came pretty close and those that were always aiming for 500 (or never performed well enough to be seriously close to T16). In a year where most players came into Indy without a chance at Top 16, there truly were 3, or more, groups of players this year. The key differentiation between this group and the other two is the proportion of CP it earned at Regionals. This group performed about on-par with Top 16 at the Local events of the circuit (on a raw-point basis), and actually outperformed them by about 30 CP on an average basis at Regional Championships. So, where was the key difference? Ah yes, International Championships. As you can see here, our 17-30th players didn’t make the trips to Internationals in quite the frequency that our Top 16 did. This is in no way a reflection on any player, or group of players, but this further reinforces the importance of International Championships in the Top 16 hunt. This is also not a judgement on those events’ importance, though I think that discussion is one that could be had. Instead, this is merely to illustrate that a North American Master’s best, if not only, practical hope at a Top 16 invitation is attendance at these International events. In order to be the best, you have to compete at the highest level — nobody is arguing that. This group attended more Regionals than the average Top 16 player, which I’m going to ascribe to the fact that those T16’ers spent more time racking up the International Frequent Flyer miles. I know that was the tradeoff I considered for London (and came to the wrong conclusion on), and I imagine it was one that many players went through as well. Once Worlds starts, these CP values are all irrelevant anyway. Further down the CP table, it’s obvious that Local Events played a bigger role. This is somewhat fitting, as they’re more readily available, meaning most players will meet a decent percentage of their allotment during the year. Regionals were still important to this group for sure, as players had to make up the gap between Cups and the 500 somewhere. To be thorough, I’m including the breakdown of Internationals attendance for this group as well. Unsurprisingly, this group didn’t really attend many Internationals — with most just hitting Indianapolis last weekend. This is the point where I’d like to delve into League Cups and Challenges a bit more. As I just said, the players at the top tended to earn their Local CP at relatively equally levels to our middle tier when considering the fact that %s don’t account for the higher raw CP total for Top 16. The following graph illustrates the relationship between Total CP and the percentage of that CP earned at Local tournaments. 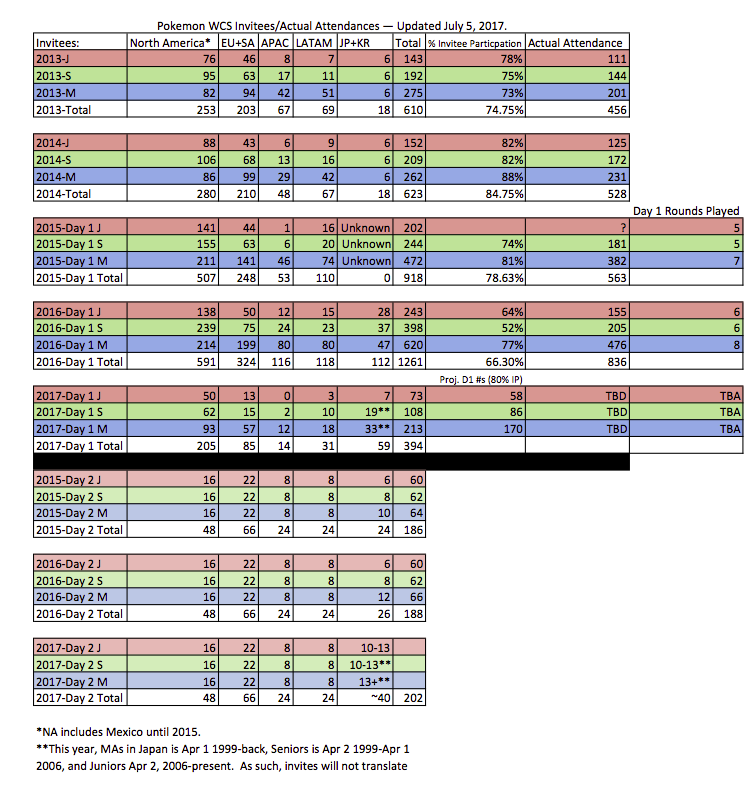 Now, it is of course relevant to consider the fact that the higher raw CP total at the top does minimize the % that Cups can count for. 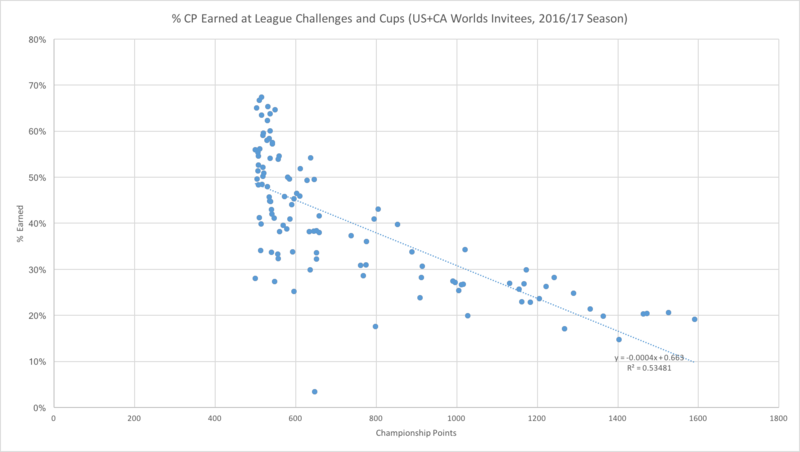 But, I include this chart for a different purpose: to underscore the importance of League Cups to someone whose goal is to make Worlds, but doesn’t have their sights set on Day 2. We’d expect to see this trend, of course, but the cluster around 520 and 50% is more defined than if there were a simple “more CP, less %” relationship. As such, this indicates Cups truly were more important to those that landed in this group. At all 3 levels of play, players certainly had to do well at what they did attend. For the first time in years, we’ve seen a decline in World Championship invites — and it’s a large one at that. There’s no question that the body of invitees this year will be among the most qualified in recent memory. Without the midseason bump, there would’ve been only a fraction of the invites that we see this year. To put this in perspective, I calculated it — you can read in all its glory here. The news would’ve been pretty, ah, interesting. 44 players would have received any invitation at all, but with 16 of those being Day 2, we’d have only seen a whopping 28 NA Masters in Day 1. Now, obviously, this is imperfect. Some players may have stopped trying once they hit the bumped 500, or other factors could’ve come into play. The point of this exercise isn’t to be an indictment on any players, but to illustrate the necessity of a move that many panned at the time. Without the adjustment, Europe literally wouldn’t have had 22 players that hit 500 CP — their original target. I don’t have the data for APAC or LATAM, but I can’t imagine it’s all that much prettier. 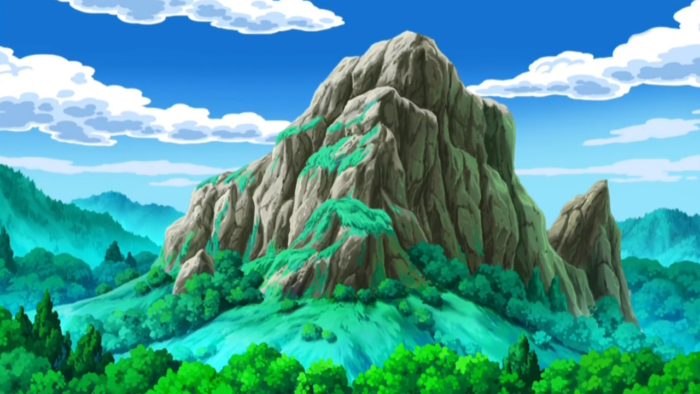 Instead, TPCi did act, and we have a relatively reasonable size for the World Championship in Masters. The story isn’t quite as straightfoward in Juniors and Seniors, where, while I don’t have the data to do a straight recalculation, it’s obvious that, even with the bump, something went wrong. There’s a complete dearth of Junior and Senior invitees this year, and I’ll be interested to see what happens with those divisions. 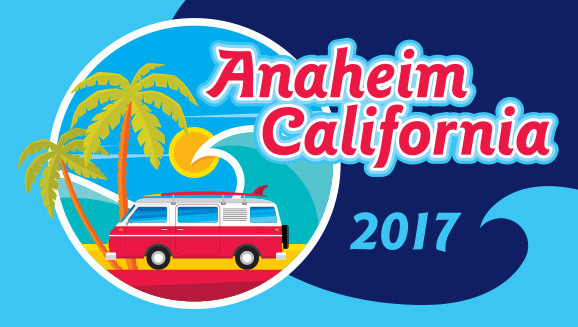 One way or another, we’re off to Anaheim in a month with whatever players TPCi decides should be in a given role. My goal here today was to profile the various paths to Worlds this year. Obviously, attending more high-CP tournaments leads to a higher placing in CP standings, and a Day 2 invite at some point. My point wasn’t to illustrate that obvious truth, but to lay out the exact numbers behind various levels of players’ attendance. With that in mind, I’ve also tried not to pass judgement on any of the attendance numbers themselves, and would be interested in reading debate on the importance of International Championships, or, to other players, League Cups. 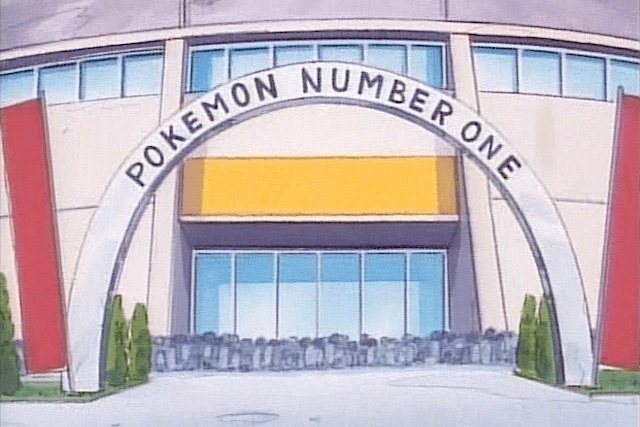 At the end of the day, it is whatever TPCi says it is, but the debate is always an interesting read — and you never know who may be reading. If there’s any more angles you’d be interested in seeing on the NA Masters CP realities of 2017, I suspect I have the data. So, if you think there’s a way to look at this that I haven’t yet, feel free to drop me a line. Otherwise, all the best at Worlds, for 2017/18, and beyond.